At Ratangiri most of the excavation is done in and around on the high mound locally called Ranipokhari or Queen’s Tank. The excavation of this site revealed the spectacular remains of two monasteries lying side by side with a narrow passage between them. They have been constructed any time between 5th to 10th century A.D.
One on the left is earmarked as Monastery No. 2. And the bigger one by its side is earmarked as Monastery No. 1. Awesome - that's some history there! Wonderful photos. There is so much we can learn from our past. If we would just take the time to do so. Have a grand day! Love that shot of your kids! So much history!! Wonderful captures for the day!! I hope you have a great new week, Rajesh!! They seem to be in such good order for buildings that have been excavated. 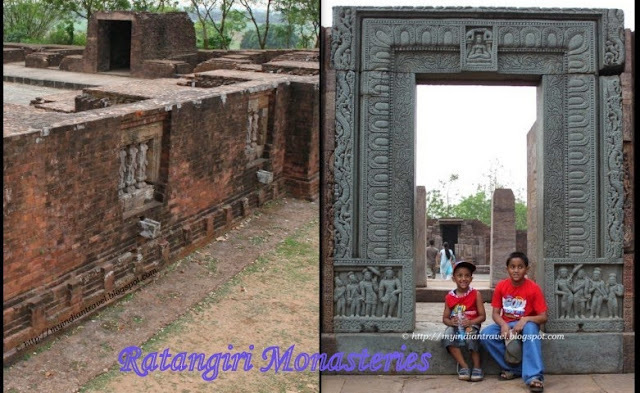 It is nice you take your sons to these historic sites, Rajesh. They will be excellent travelers one day! Nice to see so much excavation finding wonders thought lost. That doorway is spectacular...and a perfect spot for photo ops. Wonderful pictures, I really like these monasteries excavated! How very interesting. I am fascinated by archeology. I bet the boys enjoyed the mazelike rooms of the monasteries. Intricate ancient stonework and carvings. You are surrounded by history, Rajesh. the boys look as though they're coming out of a photo frame! Awesome history and love to read such posts. missed to mention the photos. Very enticing. You can imagine how it would have looked from the foundation. I bet the boys loved this. It is truly amazing how so many structures are able to remain standing since they were built since the A.D. period. I always find archaeological excavations fascinating they add so much to our knowledge of the past. Thanks for sharing this info, definitely this will be handy when I plan a visit. Both Monasteries looking that these were remain a part of rich culture ..